6 days from £1335pp plus international flights. 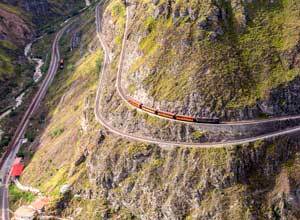 Set to become a modern 'classic railway journey' this is a superb way to see Ecuador. Tren Ecuador is a new experience in Ecuador and makes an excellent addition on any holiday in this country. It's a really fantastic way to see some of the stunning and varied landscapes. The railway line that runs from Quito through the Avenue of the Volcanoes and then down to the coast at Guayaquil has been fully restored and a 4 coach stylish luxury train now runs along this route. This is Tren Ecuador. The route also includes the famous section known as The Devil's Nose, an exhilarating series of dramatic switchbacks descending 1476 feet. As a multi-day luxury train journey using both diesel and steam engines, it is a first in South America and will become a modern classic of great railway journeys. The scenery as you pass through the Andes and down to the coastal plains is absolutely spectacular, changing from vistas of snow-capped volcanic peaks and rugged mountain valleys through seven distinct climatic zones through to tropical forests and the lush agricultural lands around Guayaquil. But this journey is not just about sitting on a train and enjoying the scenery - far from it. The train stops along the way and you spend a lot of your time visiting some fascinating places, meeting local people and staying in traditional haciendas at night. You'll see snow-capped volcanoes, watch skilled craftsmen and women at work, learn about the local culture, visit a traditional market, tour a rose plantation, see a display of horsemanship by traditional Andean cowboys and enjoy traditional cuisine. While on board the train you'll be thoroughly pampered, and can enjoy panoramic views from the observation cars and open terrace, socialise in the bar, graze on tasty snacks and buy souvenirs in the gift shop. It's an amazing way to spend a few days travelling though the heart of Ecuador at a very leisurely pace, and can be linked to any Ecuador holiday including a Galapagos cruise as flights to the Galapagos leave from Guayaquil or Quito. There are 2 classes of travel on this journey. Both use the same train but stay in different properties, or different room types, en-route. Luxury Experience stays at Swissotel in Quito, Hosteria Andaluza superior room or Hacienda Abraspungo standard room in Riobamba, Hosteria D'Franco standard room in Bucay and Hotel Oro Verde deluxe room in Guayaquil. If you upgrade to Gold Class you stay at Plaza Grande in a royal suite or Casa Gangotena deluxe room in Quito, Hosteria Andaluza suite or Hacienda Abraspungo suite in Riobamba, Hacienda La Danesa cottage in Bucay and Hotel del Parque deluxe room in Guayaquil. The guide price for Luxury Experience in 2018 is £1,335 per person, and for Gold Class is £1,785 per person. NOTE: The journey from Quito to Guayaquil is called 'Train of Wonders'. This trip can be taken in reverse, i.e. Guayaquil to Quito, 'Train to the Clouds'. Please ask us about this. 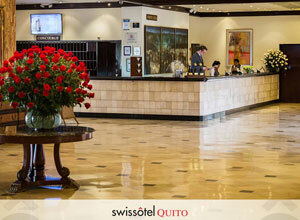 You are met on arrival at Quito airport and transferred to Swissotel. The remainder of the day has been kept free to allow you to recover from your journey and enjoy the hotel's impressive facilities. 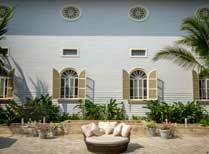 These include a spa, gym and no fewer than 5 restaurants. 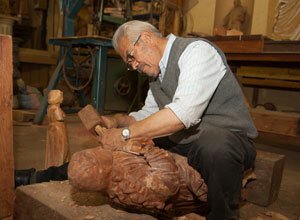 It's also close to the shops and sites of the old town should you wish to do some independent exploring. If you are travelling gold class you stay at either Plaza Grande or Casa Gangotena. 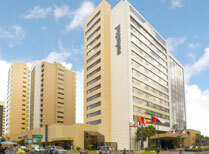 This morning, having breakfasted, you are taken you to the airport in Guayaquil for your onward or home-bound flight. Breakfast. 2 nights Swissotel on Quito, Swiss Advantage room, 1 night Hosteria Andaluza superior room or Hacienda Abraspungo standard class in Riobamba, 1 night Hosteria D'Franco standard room in Bucay and 1 night Hotel Oro Verde deluxe room in Guayaquil, all accommodation based on twin-share - Luxury Experience class; meals as specified in the itinerary; snacks and soft drinks on board the train; excursions as per the itinerary; transport by bus or van for excursions and to and from accommodation; arrival transfer in Quito; departure transfer in Guayaquil. 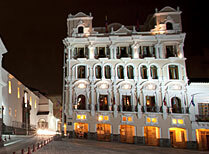 If you upgrade to Gold Class you stay at the following hotels: Plaza Grande royal suite or Casa Gangotena deluxe room (subject to availability) in Quito, Hosteria Andaluza suite or Hacienda Abraspungo suite in Riobamba, Hacienda La Danesa cottage in Bucay and Hotel del Parque deluxe room in Guayaquil. This guide price for Gold Class is £1,785 per person. International flights and taxes; meals not specified; alcoholic drinks on board; sâ€‹ingle supplement for accommodation; tips; visa; travel insurance. The 6-day trip starts in Quito and ends in Guayaquil. It can also be done in reverse. 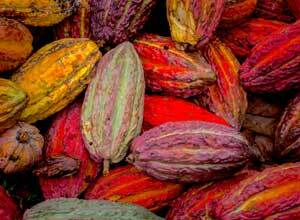 A rough guide to flights in and out of Ecuador from £900 per person. Departure dates: There are set departure dates, approximately 2 a month in each direction. 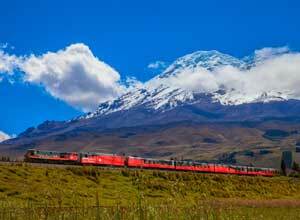 Train of Wonders departs Quito on a Tuesday, and Train to the Clouds departs Guayaquil on a Saturday. Quito is at an altitude of 2800m, and since it is only 25km south of the Equator, mostly has very pleasant days and cool nights. The city took its name from the Quitus tribe who lived here in the pre-Colombian era. The equator, which divides the Earth into the northern and southern hemispheres and after which Ecuador is named. 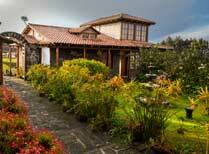 lies slightly to the north of Quito and is marked by a monument and a museum. 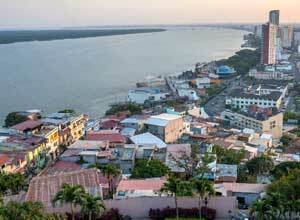 Guayaquil is a busy city and port, and often a stopover to or from a trip to the Galapagos. Isla de la Plata is about a 90 minute voyage from the mainland and is known for its marine birdlife. Situated about 40 miles south of Quito in the "Avenue of Volcanoes", Cotopaxi National Park was founded in 1979 and covers about 33,500 hectares. Hacienda Abraspungo is set in lovely gardens with views of the magnificent Andes mountains and offers traditional Ecuadorian hospitality. Family-owned dairy farm offering warm hospitality, cosy accommodation and outdoor activities. 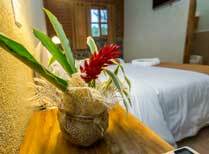 A rustic lodge in extensive grounds including a pool, with comfy accommodation and hearty food. 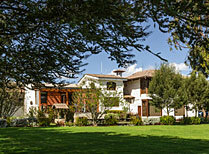 Historic country estate with cosy rooms, delicious food and great views of the Andean landscape. A beautifully restored 19th building with spacious, stylish rooms and suites and pretty courtyards, set within the Parque Historico. 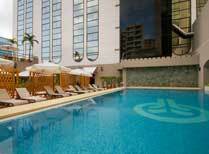 A well equipped city centre hotel with a choice of rooms and suites, pool, spa and restaurants. 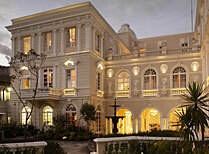 This luxury boutique hotel lies in the heart of Quito's historic district.